Setting Details: Natalie K 14k white and rose gold with halo design and caviar beading. Accommodates 1.00 carat round cut center stone. Setting features 2 shanks with a gap in the middle for a wedding band insertion. Band shown sold separately. Wedding Band Details: Natalie K 14k white gold design with antique style millgrain edges. Center band detaches from the setting shown and is sold separately. 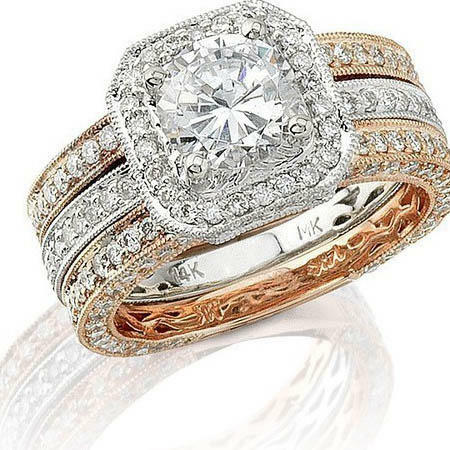 This fabulous Natalie K antique style 14k white and rose gold halo engagement ring set contains round brilliant cut white diamonds of G color, VS2 clarity, excellent cut and brilliance. The ring setting accommodates 1.00 carat round cut stone. This setting features a unique center gap made to insert a detachable matching wedding band. The band is sold separately.